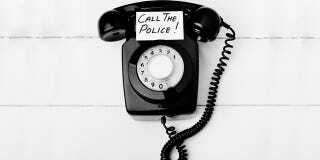 According to a recent FCC notice, anyone dialing 911 in the small township of Caddo County, Oklahoma was greeted by an automated recording telling them to "hang up and dial 911." A ghoulish game of merry-go-round that went on for months. [Hinton] undermined betrayed its customers' [trust] when for several months in 2013 it apparently routed 911 calls from Caddo County, Oklahoma, to an automated AT&T operator message which instructed callers to "hang up and dial 911" if their call is an emergency. That trust was further betrayed when Hinton allegedly continued to allow 911 calls to be routed to the automated message for three months after the company discovered the problem. The company returned the system to functionality only after being contacted by FCC investigators and directed to do so. So how does something like this even happen? According to Hinton, the whole issue stems from the fact that the county Sheriff's office refused to accept 911 calls in 2002 due to a lack of resources. Forcing Hinton to route all 911 calls to a (then live) AT&T operator who would connect callers to the appropriate service. Then, when the county set up a Public Safety Answering Point (or a call center with the express purpose of answering emergency calls) in 2013, Hinton didn't change a thing. All Caddo County 911 calls continued to be sent to the AT&T operator who, by that point, had been replaced with little more than an answering machine. But even after Hinton found out about their little oversight in May, they still didn't do a goddamn thing. It wasn't until three months later in August that the company finally corrected their generally atrocious routing practice. And then, only because they were ordered to by the FCC.